Jared Decker has put forth extra effort on several social media channels, including Twitter, Facebook, YouTube and message boards. He uses those channels to promote his blog, A Steak in Genomics. The blog is focused on cattle research and industry news. 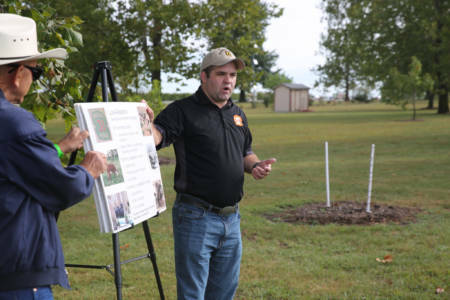 University of Missouri Extension specialists put a strong focus on interacting with Missouri producers, farmers and ranchers. Jared Decker, a beef geneticist, is taking that interaction one step further. Decker has put forth extra effort on several social media channels, including Twitter, Facebook, YouTube and message boards. He uses those channels to promote his blog, A Steak in Genomics. The blog is focused on cattle research and industry news. Decker, who earned a $2 million grant in May to study cattle genetics, puts an emphasis on face-to-face interactions and traditional communications, such as popular press articles, presentation and working with groups. His blog and social media channels are an extension of those face-to-face interactions. Jared Decker gives his take on research MU is conducting as well as happenings in the beef cattle industry on his blog. Decker’s blog actually began before he started at the University of Missouri. Decker earned his Ph.D. in genomics from Mizzou in 2012 and was hired as a beef geneticist in 2013. The blog began just three months after Decker earned his Ph.D.
Decker gives his take on research MU is conducting as well as happenings in the beef cattle industry on his blog. Decker will also discuss possible misunderstandings or issues that need to be addressed. His posts are research-based. Decker also blogs during several of the meetings that he attends. He will record video of speakers, too, to show to interested individuals who couldn’t attend. There was a small learning curve when Decker first began his blog. The main obstacle was how to interact with people who don’t agree with Decker’s posts. He had to quickly grow thicker skin and become more receptive to negative feedback. “When you interact with people online, you get their thoughts unfiltered and pure,” Decker said. “I’ve had some people who were really negative about the messages that I’ve tried to get out. I’ve learned that this is actually a benefit. I now get their true feelings, and now I have a much more accurate picture of what the varied opinions are in the beef industry. I can now start finding the correct way to discuss or frame content that makes them more receptive to the technologies that have been around for 40 years or the brand new technologies. Another challenge Decker has faced is the actual adoption of new technology and social media. He said that there are only a portion of beef producers who he’s interacted with who are plugged into social media. Even other technology, such as artificial insemination and Expected Progeny Differences (EPDs), aren’t always widely accepted. It helps that Decker grew up on a farm and raised cattle. He has a hobby farm as well where he raises cattle. Those experiences do bring some legitimacy to what Decker discusses. Decker’s work has not only provided extra information, it has led to opportunities outside of Missouri. He has been invited to several states to speak about current genomic research. He has already presented in Indiana and Texas and he will make another trip to Texas as well as Montana and North Carolina this year.